Greetings. We added a couple new forum rooms on here, or sub forums. One is the Introduce Yourself Here forum, and the other is the new one, which is Off Topic Discussion. In the main general discussion forum you can still post breaking important news that is off topic of course. Nothing has changed. If you want to talk about anything completely different, feel free to post it in the Off Topic forum. Ultimately we want the OT forum to have the latest breaking news for important current events happening now such as with the shootings, etc.. similar to a "current events" type of forum and with breaking news. Anyway, If we ever have anything too crazy going in any of the threads, then the thread will be relocated to the new forum room called "the dungeon". We might have to move some of the current topics in the new OT forum there to clean it up. Either way, you're all fairly sharp and you can post in any of the General Discussion forums about anything. Latest News: A post that doesn't have anything to do with pandemics, flus, ebola, etc... it will have to be moved to General Discussion, with nothing indicating the post/thread was moved. Don't panic though, it's in the GD forum. A thanks to Hachiban for the suggestion on the new OT forum. I need to also add - Feel free to start your own personal thread in Introduce Yourself Here. You can even post as a "guest" if you prefer. We recognize most of the names. If can be your very own thread for down the road and you can yell about anything you like. Awesome! LOVE the Dungeon idea! ..........................................................The Dungeon.............................Ha. Ha. Ha..... I love it. Trolls hide under bridges. The dungeon is worse. ...............................................I am there! Ha Ha Ha! Albert: Don't panic though, it's in the GD forum. Albert- Could you add one for influenza? There are so many posts about Ebola that unless I'm here 24/7 any Flu news is lost. Maybe in the emerging disease forum. I know. It was instantaneous. poor forum, the next best is Gen Dis for general disrespect. Abreviations can be funny haha. How unfortunate for General Discussion. It's odd how Avian Flu Talk has evolved more into Ebola Talk. I suppose ebolainfo.org is the official Ebola forum of AFT. If anything i think it would be more appropriate to create a new forum here dedicated stricktly to Ebola rather than the other way around. The one drawback though is too many forums and sub forums gets one buried as well. Personally I'm not sure what would be best with that. Perhaps I could start by butting out asyour question was not directed to me. Now there's a start. onefluover- I value your opinion and any suggestions you have! I'm just saying it's getting harder and harder to find info about flu and the season is right around the corner! There is not much news on flu right now, seasonal/H1N1. 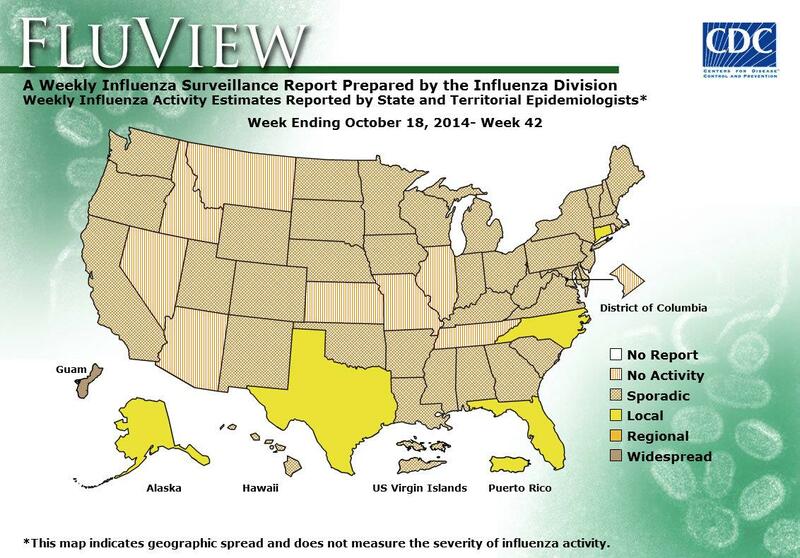 There is an updated CDC map with shows 5 states are already "Local" in geographical spread. I will update sf.org with most recent maps as soon as Albert can fix my Insert Image problems over there. But until then... here you go, map usually updates every two weeks so we are due an update this weekend.